a rescue-piano bringing joy to the world. I know what you're thinking... "Oh wow, a piano at the beach, that's so cool... OMG, wait! are they going to cover it?? They should totally cover it!" After being rescued and uncovered for everyone to see, #ForPlay has now been played by hundreds and enjoyed by countless amounts of people. One piano can impact thousands of people if given the opportunity... and now it does! Come see. Come listen. Come play. Come enjoy. #ForPlay is art. #ForPlay is community. And most importantly, #ForPlay is... for play! "The Strand community needed this! Thank you so much." "The Strand Gardens" is a public space (the area between The Strand and the beach) maintained & regulated by the city of Manhattan Beach and LA County Coastal Commission with the primary intention to preserve the views of the beach for pedestrians & residents on The Strand, and to preserve public access. The space where #ForPlay originally sat was previously overgrown with invasive ice-plants (as most of The Strand Gardens are), which goes unused by the public, and had an overgrown shrub blocking partial views. Today, it is the highest-trafficked (resident-improved) public space on The Strand Gardens, thanks to improving its view and making it accessible. The once overgrown shrub has now been touched by topiary with inspirations of bonsai-tree and cloud-pruning techniques in order to enhance the view of the beach from The Strand. 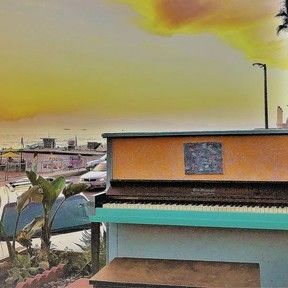 The leveled patio space enables & encourages public access, and while the space invites people to visit and enjoy the view, #ForPlay the piano can be attributed to bringing neighbors and passerby's together under one common ground... Joy. Residents and visitors from everywhere have complimented the space and the experiment with more than just words of encouragement & gratitude; they've shared their smiles, laughs, and some, even tears. Most importantly, they've lent their genuine participation in what this initiative was meant to do... Bring people together. #ForPlay has moved on now to a new location (listed below) and we hope to see it move from community to community as we follow it. Please Tag #iamforplay in all your social photos and videos! Thank you. At the very end of The Strand and 45th St in the El Porto (north end) section of Manhattan Beach, CA.